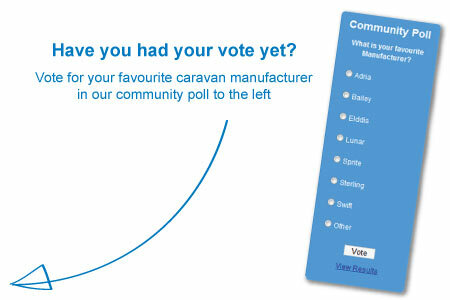 You might have noticed we’re running a community poll down the left hand side of our news blog to find out which is the favourite caravan manufacturer amongst our readers. If you haven’t done so already then simply select your favourite manufacturer from the list below and click ‘vote’, it’s that easy. Once you’ve voted you’ll be able to view the current results and see which manufatcurer is top of the leaderboard. Feel free to share this page with your caravan buddies so they can have their say too. Why not tell us why you’ve voted for your chosen manufacturer in the comments section below. Or if your favourite manufacturer isn’t listed then vote for ‘other’ and add a comment to let us know who we’ve missed. Sorry Paul, we made a mistake not to include Coachman. If we run the poll again, we’ll certainly include as we got loads of feedback from Coachman owners when we ran the poll. thanks for your comments, I agree Coachman should really have been in there. I’ll definately mention this when we publish the final results as I imagine a few people have voted for ‘other’ as Coachman isn’t an option. Our mistake, and we’ll makesure they are in the running in future polls! I previously owned an Avondale Avocet which was a good caravan but now have a Lunar Lexon 580CSL which I am told is a rarity. Well equipped, good build quality and tows like a dream. I won’t be changing anytime soon. All my previous vans have been Eldiss and all have been 1st class, changed to a Lunar last year and so far it has been excellent. 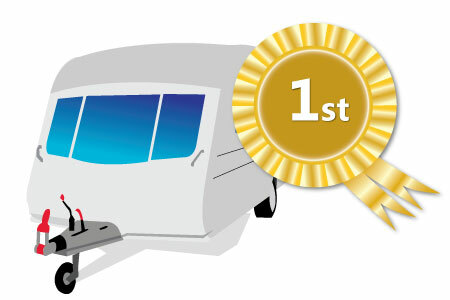 We have had a Bailey caravan for about a year now and travelled approximately 2000 miles and visited 13 sites with no problems. The build quality is excellent and it tows like a dream. Having had other caravans, this the first one that looks and feels as if the designer has actually spent a few nights in it, although there is still room for improvement. For example, although I’m not particularly tall, anyone over 6 ft will struggle with most caravans built in the UK, so I can only assume most caravan designers are 5 ft 7 in or below. Cannot believe you have not got Coachman on your list. I had to vote others because they were not listed! I voted for ‘other’ because amazingly the manufacturer ‘Coachman’ isn’t listed for some reason.